After far too long without posting an update here, I am back in action!!! I haven’t been able to do much hobbying until recently due to some time consuming home renovations which put my hobby room out of commission and then a long vacation up to Alaska, but now I’m back and firing on all cylinders! This is a quick look at what I’ve been working on since I got my hobby room back. I have several models here which are very nearly finished, so keep your eyes peeled for some photos of finished miniatures in the next few days. Also, I’m making my annual pilgrimage up the GenCon next week and once again I’ll be posting my Guslado Goes to GenCon series! Wednesday is upon us, so it’s time to share what’s been on your table this week–once again it’s Work in Progress Wednesday! I started hitting some details on Bansuva to get him a little bit closer to the table; he still needs a good deal of work, but I like the direction he’s headed in. I’m trying out a new formula for painting fire and I’m digging how it looks after the first couple of steps, I can’t wait to see how this will look with a little more work on it. I was also looking for a way to make small discs which fit exactly inside the lip of a round lipped base so that I can make a few less elaborate marble bases to go along with Sandeep and friends. I found that one of the dropper bottles I use is the perfect size to basically make a cookie cutter that makes discs that will fit inside a 30mm round lipped base. Greenstuff turned out to be too sticky to get a good clean cut, so I picked up some Super Sculpey to try out and I was quite happy with the end result. While I was at the art store I also saw some cool press molds designed for polymer clays, so I get one with a bunch of faces on it that I think will look really cool for basing. Some spiders and some scrap markers. I ran out of super glue so nothing is attached to the bases, but this is a good idea of how they will be positioned. Big Blue on his WiP home! I finished the marble effect on the base and added the glow in the cracks to make it look like Bansuva cracked the marble when he appeared. Solid turn-out for my first tournament! Hey all! Just a quick Work in Progress Wednesday post for this week as I’ve been crazy busy and haven’t had time to get in as much hobbying as I would have liked to. I made some great progress on the marble bases for Sandeep and Bansuva. I also built some Steam Arachnids I’ve had sitting in my hobby closet for a while since I’ve been playing a fair amount of Ramos lately and haven’t had enough. Additionally, I built Nathaniel Garro and Tylos Rubio from 30k that I’ll be painting as a commission. Over the weekend I ran a Malifaux tournament for the first time; I had twelve people show up to play. Everyone had a great time and are looking forward to the next even at Dragon’s Lair. All in all a busy, but successful week. I did a marble technique on the bases and then tinted them green with a Ghost Tint. The two larger bases will be used for basing Sandeep and Banasuva; I painted the small base to try out this technique on so that I wouldn’t screw up bases that I cared about. To make the bases match my reference material better, I added in white veining to the bases after the Ghost Tints had dried. One base veined, one to go. Once I completed the veining and hit the entire base with a spray on gloss varnish, I decided to put the base into my light box to see how it looks. I just need to clean up the base rim and then this base will be ready for Sandeep! The middle of the week is here once again, this means that it is time to celebrate being half way to the weekend by sharing what’s been on your hobby table–it’s Work in Progress Wednesday!!! This week I’ve been focused on trying to master a new technique: creating a marble effect on bases. I found a cool tutorial on making marble bases a while back and modified the method to get the look that I wanted. This involved adding in a few more steps and getting some special sealant, but I’m really happy with how they are looking so far. This was my first time playing around with Ghost Tints from Badger and I’m impressed with the cool effect I was able to get with them; I will definitely be coming up with other cool uses for them in the future. It’s Wednesday, so hopefully by now you know what that means–it’s Work in Progress Wednesday! This week I’ve been busy working on some midterm projects for my game design studies, so I haven’t had a ton of time to paint, but I did manage to I finished off the Sigismund commission I’d been working on and managed to finish some other models I’ll be posting some photos of later in the week. 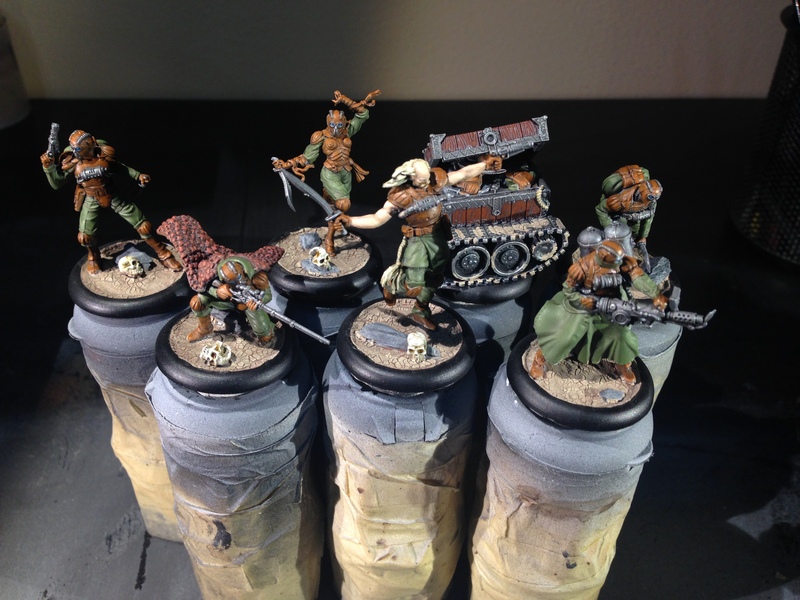 The small amount of other painting I completed was on the Von Schill crew I’ve been doing as a commission project; I’ve been a mercenary brush painting mercenaries. Once those are done, I’ll have a couple of other small commission jobs to handle and then I’ll be able to start taking more commission jobs. If you’re interested in commission work, I’ll be posting more info once the decks have been cleared and my brush is once again available for hire. 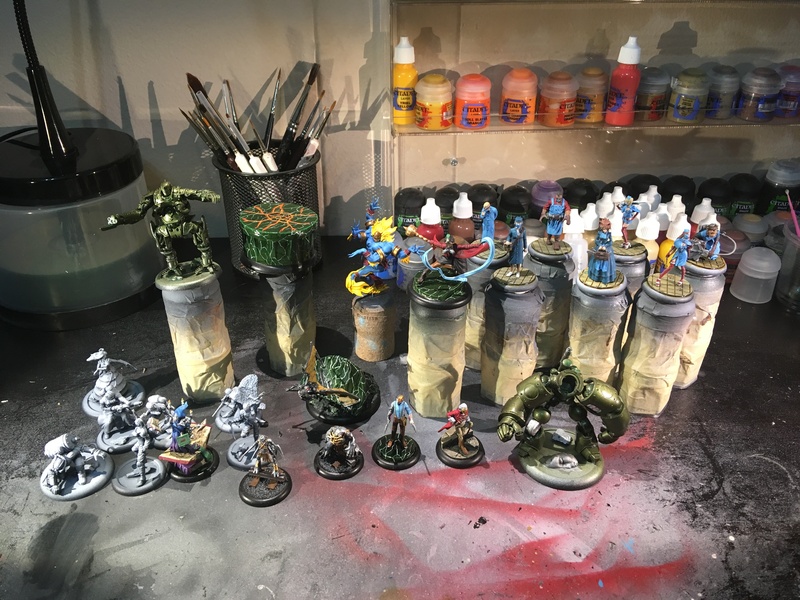 Once again Wednesday is upon us, which means it’s time for all good hobbyists to show off what’s been on their painting table this week–it’s Work in Progress Wednesday!!! On my table this week I have a handful of models that are nearing completion–the Sigismund commission is down to final detailing and assembly, the Von Schill crew just needs a few more details, and the Wind Gamin just have final clean-up and basing left. I should actually be able to post some photos of newly finished miniatures soon! I have been quite busy of late as I recently made the decision to leave my job to return to school to study game design and thus I’ve been rather busy with school work lately. As I am nearing the middle of the semester I feel like I’m finally settling into a routine, so hopefully that means I’ll be able to share more finished projects with you all soon. Also, I will be able to start making those that I promised a few months back. Keep your eyes peeled for some cool stuff headed your way soon! Work in Progress Wednesday 2-22-17: Level Up! Hey everyone! Once again Wednesday is here, so it’s time to show off what’s on your hobby table! Greetings fellow hobbyists! It’s Work in Progress Wednesday, so it’s time to share what’s been on your hobby table this week! I’ve been working on clearing some commission projects off of my hobby desk. I did some work on the final detailing and assembly on Sigismund and got started on the Von Schill crew you see above. While it’s not specifically WiP from this week I have some super exciting news to share with you all. This weekend I’ll be heading up to Dallas to take a 2-day airbrush class with the wonderful Caleb and Kat from CK Studios! It’s going to be awesome to see some of my scattered hobby friends again and I’m really looking forward to learning a lot in this class. I’ll definitely have some pictures from that to share with you after this weekend. Work in Progress Wednesday 2-8-17: Pedro Es Muy Guapo! 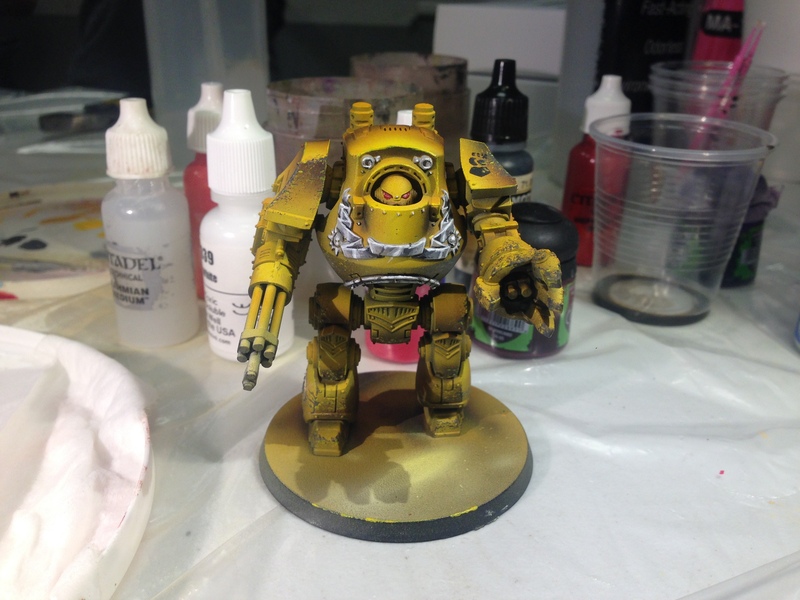 Wednesday is upon us, which means it’s time for all good hobbyists to share what’s been on their hobby table this week–it’s Work in Progress Wednesday!!! This week I finally got started on final assembly and touch-ups on the Sigismund commission I’ve been doing for a friend. I also primed up a Von Schill crew I’m painting on commission for another friend. Last and certainly not least, I sculpted a poncho to go on a friend’s Peacekeeper; my friend usually runs Pedro (as the Peacekeeper is known) with his Perdita crew and tends to use Abuela to marry him into the family, hence why he needed the poncho and sombrero. Before next week I will hopefully have a few more models finished up to share with you all, so keep your eyes peeled for those! Once again it’s Wednesday and that means it’s Work in Progress Wednesday!!! I actually put some paint on things!!! I took the first step on putting a marble effect on these bases. A nice painting warm-up before working on centerpiece models. 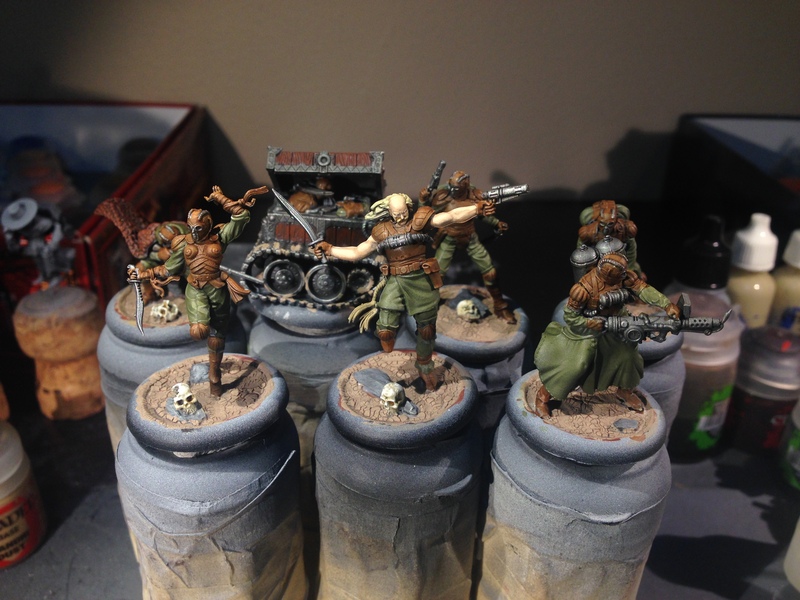 This week I put paint to miniatures for the first time in far too long. As I want to get my painting mojo running at full tilt before I start in on things I care about, I started in on some Wind Gamin as I never expect those to be on the table for too long; hopefully I’ll have them finished before the week is over. I also started in on the marble bases for Sandeep and Banasuva. I’ve only taken the first step on them so far so there’s still a ways to go before the marble effect is finished, but I can see where I’m going with it now. Now that I’m back into the swing of things hobbywise and have managed to post things here two weeks in a row, let’s hope that I can keep this going!